Is it OK to have Only One Child? Posted byMei 28 December, 2011 2 March, 2019 8 Comments on Is it OK to have Only One Child? I’ve struggled with this issue and like to end 2011 with a ‘preliminary’ conclusion. So, as I always do, I research. 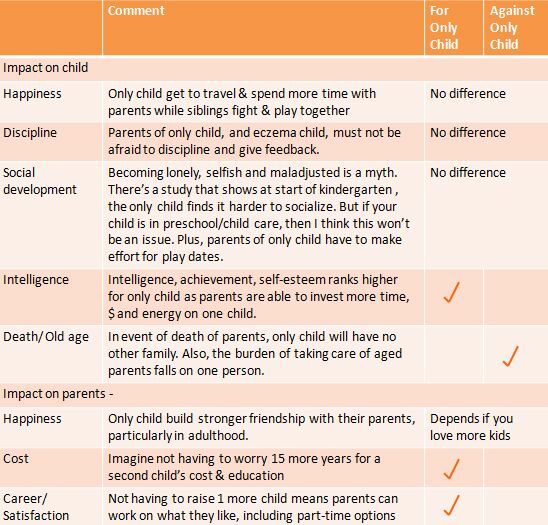 And based on recent studies, there is no evidence supporting that the only child will fare worse than children with siblings, in fact fare better in areas of achievement and intelligence. Here’s my pros and cons list. Since, we’re already on the topic of social development; this research shows that eczema child has more behavioral problems (23% vs 5%), shows signs of fearfulness to strangers (40% vs 10%), more dependent on parents (50% vs 10%) and have sleep difficulty (this, we all know, see this post). 25% of eczema children aged 2-13 years old, 39% aged 14-17 years old and 28% aged above 18 years old are teased or bulled due to eczema. Issues usually arise if the eczema is severe, such as bandages are required or the rash looks quite bad that other children avoid the eczema child. The good news is that behavior issues are temporary, usually cease when the eczema got better. Moms of eczema children, although much more stressed, are more empathetic to their children which help to reduce behavioral issues. Well, I turn 36 next month, so I know I am done! 😉 Yes, you can definitely consider fostering or adoption. I was adopted at birth and I am so grateful for that! Dagmar, I’m still struggling struggling… in Singapore, almost everyone has two, or three! The idea of having just one child is not accepted. Every family package at outlets is 2 parents, 2 children!